Gorgas Blood Bank Ends First Year With Plus Balance A plus balance of 140 pints was credited to the Pacific Side Blood Hank at the close of the hank's first year of operation, according to figures compiled early in December at Balboa Heights. The blood bank, formally known as The Pacific Side Blood Replenishment Program operation, is strictly a volunteer program. A similar blood bank is now being set up on the Atlantic side and should be in operation early this month. Under the blood bank program, no Company-Government employee, or member of his family, is charged for blood taken from the bank. The program on the Pacific side got under way on November 23, 1956. Its headquarters are at Gorgas Hospital. The first annual report for the operation shows that all Company-Government bureaus, except one, have a plus balance for the first year of operation. The Army, Navy, and Air Force, which have donated a total of 505 pints of blood during the .year, had a surplus on hand of 95 pints on November 22, closing date for the annual report. Under the blood replenishment program, employees register as prospective donors in their respective bureaus. They are then called upon if a fellowemployee, or member of his family, requires blood. Occasionally more blood is supplied than needed, and the Division or Bureau involved is then credited with the surplus. The Housing and Grounds Division, for instance, has supplied 35 pints of blood, but only 14 of these have been used, leaving the Division with a credit of 21 pints for some possible future use. In special cases, such as when donors cannot supply specific blood types, the Bureaus have an informal reciprocal agreement. The donating Bureau is credited when this happens. New employees, or others who have not registered as donors and who wish to give blood should see their unit, branch, or division representatives as to the procedure to be followed for participation in the blood program. Barlow Now A Consultant For St. Lawrence Seaway Edward "Barney" Barlow might well be said to have canal water in the blood. After locking thousands of ships through the Panama Canal as controlhouse operator and supervisor at Miraflores Locks, he retired a year ago with over 40 years of service. During that time he also told tens of thousands of visitors to the Canal Zone how the Canal operates both as a Canal employee and as a tour director in his spare time. A year of retirement without a canal to operate and no tourist to enchant was enough. Last month Barney accepted a job as Consultant with the St. Lawrence Seaway Corporation in Massena, N. Y. News of his new job has just been received by friends in the Canal Zone. 50 Years Ago An important decision the width of the Canal locks -was made 50 years ago in January. With a width of 110 feet approved by President Theodore Roosevelt January 15, and work already started on relocation of the Pacific locks three miles inland (to their present site), the Canal builders were finally ready to swing into concentrated action. Although the 10-foot increase in width would add about $5,000,000 to construction costs, it icas in keeping with the wishes of the Navy which had held that 100-foot locks would not accommodate its future vessels. No one, 50 years ago, of course, had ever considered canted flight-decks! The day after the President approved the wider Canal locks, Secretary of War William H. Taft, went before the Senate Committee on Interoceanic Canals, testified that the waterway would be completed six years from the following July, and that its ultimate cost would be approximately $300,000,000, including the purchase price. On the Isthmus, work was proceeding at a dizzy pace. In January 1908, excavation totaled 2,712,568 cubic yards, the first time that the 2,500,000-mark had been reached. And the labor force was rising. "Small shipments" of men came from Spain and Barbados, The Canal Record reported, and a number of laborers were recruited from the United States. At Ancon, the new Administration Building, now the District Courthouse, was completed and beginning to fill up. It housed the offices of the head of the Department of Civil Administration, the Division of Posts, Customs and Revenues, the Department of Sanitation, and the Secretary of the Isthmian Canal Commission. Work started on a permanent Canal Zone Quarantine Station on Culebra Island, now one of the "Fortified Islands" group. The Station was to consist of 10 buildings, two of which were to be isolation wards for suspected cases of infectious or contagious diseases. At a meeting, January 30, 1908, the Isthmian Canal Commission decided that any radical change in the commissaries "icould imperil the future success of the work and the welfare of all classes of employees." The Commission, accordingly, declined Panama's demand for restriction of commissary privileges, the demand for restoration of a bi-monthly pay-day, and a demand for discontinuance of the couponbook system. 25 Years Ago Traffic through the Panama Canal again slumped downward 25 years ago last month, after several months of a slow but steady rise. In January 1933, commercial transits totaled 415 ships, 16 lower than for the previous month. The sudden death of former President Calvin Coolidge, at his Massachusetts home brought Canal Zone flags to the half-mast for 30 days. Zonians who had begun to feel the January 3, 1958 THE PANAMA CANAL REVIEW 13 pinch of the Government's economy wave regained some hope when labor leaders reported that a Senate subcommittee had recommended restoration of leave privileges for Canal-Railroad employees, except for a month's furlough. On the other hand, they learned that Congress had in mind an additional If percent pay cut for Government employees. January, 25 years ago, brought two special visitors to the Canal Zone, both of them former members of the Isthmian Canal Commission. First to arrive was Rep. Maurice H. Thatcher. His stay included a trip up the new highway which bears his name, and on into the Interior of Panama. The second visitor was Gen. William L. Sibert, who had headed the Atlantic Division during the construction period. 1 Years Ago Repercussions from Panama's rejection of the defense sites pact were still being heard 10 years ago this month. Senator William F. Knowland, of California, introduced a bill before Congress to give the administration "full authority to enter into a supplementary treaty with Nicaragua and go ahead with canal construction" there. And in the House of Representatives, Rep. Willis Bradley, another Californian, presented a bill calling for an Inter-oceanic Canals Commission to study the Panama Canal and determine whether additional canals were needed to safeguard the interests of the United States. An acute shortage of tanker transportation and petroleum products in the United States was felt in the Canal Zone, in January 1933. Local oil companies began a voluntary rationing system with many of their clients. The trip of Rep. J. Parnell Thomas, of the House Un-American Activities Committee, to investigate communist infiltration in the Canal Zone was upset by an acute illness. 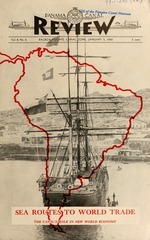 After he became seriously ill aboard the "Ancon," en route to the Canal Zone, he was taken from the ship directly to Margarita Hospital where he remained during his entire stay here. Several construction projects and one move were under way. Canal officials announced a $910,000 program to build masonry quarters in Diablo Heights, Margarita, Paraiso, Camp Coiner, and Silver City, and began evacuation of three old houses to make room for the new obstetrical building at Gorgas Hospital. They also confirmed plans to close Margarita Hospital July 1 and consolidate all Atlantic side patients in Colon Hospital. One Year Ago From a vantage point at the old site of Culebra, the Panama Canal Company's Board of Directors got a look at the busy Canal below, and then came down to water level to transit the Cut and look over operations at closer range. The occasion was the annual meeting of the Board. One of its results was formation of a special committee, headed by the Governor, to study capacity problems. the Locks Security Branch; and Philip Schneider,.i marine machinist in the Industrial Division. Mr. Monroe w.is horn in Dickson, Tenn., and served 20 /ears with the 1 S. Arm) before being employed in l4;< 1>> the Mechanical I 'i\ ision as .1 guard. lie has been with the 1 ocks Division since 1953. Mi Schneider was born in Zegram, Austria, i> .1 naturalized U. S. citizen, and served 13 years with the U. S. Army. He was employed in 1940 as a foreman in the Maintenance Division, was transferred in 1<>44 to the Mechanical Division as a machinist, and has Ween with the Industrial 1 >i\ ision since 1950. 25 YEARS A quarter of a century of Government Sen ice was rounded out in December by three employees of the Canal organization. Nathan Fleckner, Plant Accounting Assistant in the Plant Accounting Branch, was the only one to have continuous Canal service. Born in New York, he was employed as a clerk in the Record Bureau in 1937 and was transferred in that same position in the Maintenance Division in 19.19. He has been with the Office of the Comptroller since 1941. The two other employees who celebrated silver anniversaries last month were Earl O. Dailey, Pacific Side Area Engineer for the Power Conversion Project, and Howard L. Sampsell, Foreman Locks Operator in the Locks Division. Mr. Dailey, a second-generation Canal employee, was born in Rogen, Colo., and came to the Canal Zone with his family. He held student jobs as a boy and joined the Electrical Division in 1936 as a wireman engineer. He was Supervisor of the Electric Work Branch in Balboa from 1950 until 1955 when he was transferred to the Power Conversion Project as Area Engineer. He was first stationed on the Atlantic side and recently was transferred to Balboa as Pacific Area Engineer. Mr. Sampsell is a native of Philadelphia and fitst worked for the Canal in 1925. He resigned after a year and was reemployed in 1935 as a wireman in the Electrical Division. He has been with the Locks Division since 1936. 20 YEARS Only three of the nine employees who passed their twentieth year of Government service in December had unbroken service with the Canal organization. They are Richard G. DinkgTeve, of New Orleans, who is Office Services Supervisor in the Electrical Division; Louis F. Harris, born in Bowling Green. Mo., and now a sergeant in the Locks Security Patrol, and Miss Winnifred E. Seeley, a former Canadian, who is a head nurse at Gorgas Hospital. Those with broken Canal service are George P. Allgaier, of Reading, Pa., employed as a marine machinist in the Industrial Division; Robert H. Bartram, a native of Scranton, Pa., also a machinist in the Industrial Division; Hubert W. Jarman, born in Clarkesville, Tenn., a foreman stevedore in the Terminals Division; Ralph E. Masters, of Erwin, Tenn., now a member of the Canal Zone Police stationed at Gamboa; Braxton W. Treadwell, a native of Clay. Ala., now with the Canal Zone Police at Gatun; and Matthew J. Wilder, who was born in Baltimore, Md., and is now a fire sergeant in the Balboa District. 15 YEARS Fifteen years of Government service were completed in December by 21 employees of the Canal organization. Nine of these have unbroken Canal service. They are Winston P. Abernathy, Time, Leave, and Payroll Clerk in the Payroll Branch; Leonard E. Case, Fleet Engineer in the Dredging Division; Karl D. Glass, Policeman in Gamboa; James H. Hagan, Lead Dock Foreman, Navigation Division; John E. Hotz, Sergeant, Locks Security Patrol; Joseph A. Janko, Sergeant, Locks Security Patrol, Pacific Locks; Fred E. Mounts, Policeman, Balboa District; Erwin R. Oesterle, Jr., Window Clerk, Postal Division; and James M. Snell, Pipecoverer and Insulator, Industrial Division. Others passing their 15th anniversary of Government Service last month were Mrs. Violette D. Allen, Clerk-Stenographer, Supply Division; Frank R. Castanzo, TowingLocomotive Operator, Locks Division; Mrs. Marjorie L. Engel, Clerk, Personnel Bureau; John C. Fawcett, Teacher, Balboa High School; Mrs. Mildred R. Largent, Staff Nurse, Gorgas Hospital; Lyle B. MoSeminar Group Prof. Norton Backer, of New York University, is shown above addressing one of fhe two large groups of employees from ihe Office of the Comptroller and other units who were chosen for a two-week lecture series on cost accounting. This is the third of such lecture series to be presented as a part of in-service training. Mechanized Care of Grounds Coming Soon For Canal Zone That well-known Canal Zone figure, the macheteman, will soon be almost a thing of the past. Instead of whacking away at the edges of lawns, stubborn undergrowth, or simply a few blades of grass, most of them will be riding or rau, Police Sergeant, Balboa District; Francis J. Reilly, Plant Accounting Assistant. Office of the Comptroller; Albert N. Ruoff, Diesel Operator Machinist, Electrical Division; Roy A. Sharp, Lead Foreman, Housing and Grounds Division; Kenneth A. Thompson, Auto Repair Machinist, Motor Transportation Division; Mrs. Mary B. TurbyrJll, Elementary School Teacher, Diablo Heights; and Merlin B. Yocum, Supervisory Cargo Officer, Terminals Division. RETIREMENTS Retirement certificates were presented the end of December to the following emplov^es who are listed alphabetically, together with their birthplaces, positions, length of Canal service, and future addresses: Lester Thomas Brennan, Missouri; Lead Painter Foreman, Maintenance Division; 11 vears, 6 months, 28 davs; San Gabriel, Calif. Howard R. Harris, Tennessee; Mechanical Supervisor, Atlantic Locks; 30 years, 7 months, 11 days; Knoxville, Tenn. Antonio Ortiz, Puerto Rico; Grease-Rack Attendant; Motor Transportation Division; 24 years, 11 days; Panama. Norman A. Terry, New York; Ferryboat Master, Navigation Division; 17 years, 11 months, 6 days; Canal Zone for present. Allen G. Tuttle, Montana; Motorboat Maintenance Mechanic, Navigation Division; 17 years, 7 months, 8 davs; Pomona, Calif. January 3, 1958 THE PANAMA CANAL REVIEW 15 guiding one of the Housing and Grounds Division's fancy new machines, doing the same jobs a lot faster and without having to stop every few minutes to sharpen a machete. Already in use on both sides of the Canal Zone is such new equipment as edgers, lawn sweepers, hedge shears, and power mowers of a type never seen here before, together with a lot of other specialized pieces which will make the care of grounds a lot quicker and more thorough operation. All of the 14 types of new grasscutting, lawn-cleaning, and general tidying-up machines are being used on a trial basis. So is a new vacuum streetcleaner, different from the street-cleaning machine which was tried here some years ago and did not prove particularly successful. When the Housing and Grounds personnel have decided which machine does which job the most efficiently, they will recommend the purchase of more machines of the most satisfactory kind. The adoption of a mechanized system for keeping the Canal Zone's grassy hair cut and combed is in line with the efforts of the Canal administration in many other fields to economize by a more efficient use of its manpower. Officials of the Housing and Grounds Division have high hopes for their planned mechanization. With all of the new kinds of machinery available, they see no reason why the Canal Zone cannot always be neat and tidy, even at times of year like the present, when leaves are falling from the deciduous trees.